Home » Mains » Flax Seed Pizza! I’ve made pizza type dinners before: flattened pork or chicken covered with marinara sauce and toppings, meatza (a beef or pork base covered with toppings, cauliflower base covered with toppings, and a cheese base. And they’ve all been pretty tasty but not quite pizza-base. This one changes the game though. This was thin and crunchy and even though I still ate it with a knife and fork, you could probably pick it up and eat it traditional style. Of course, I made a rectangular pizza – just to be annoying. But that was so I could cut it into 4 giant bits and loudly proclaim before anyone tucked in that I would have leftovers for lunch the next day. Phew! I made the base, and then I made my own marinara type sauce for a topping. You could use your favourite pasta sauce (check the ingredients – that’s why I made my own! ), or just tomato or whatever you usually use to top a pizza. I didn’t put cheese on top because that seemed a bit overkill with the cheese, nor did I have any mozzarella but that woulda been pretty tasty as well! In a food processor (or mixing bowl), throw in all the ingredients for the base and mix well. It actually becomes quite a sticky dough consistency. Spread the dough out on the paper using wet hands and flatten as much as possible. 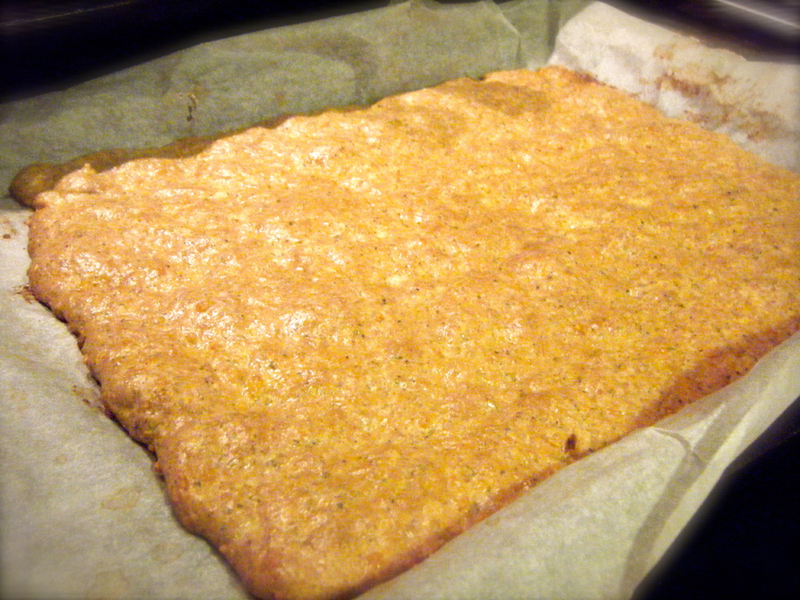 I managed to stretch it out to be 1cm thick and almost the entire large baking tray. Use your judgement here! While it’s baking, make your sauce (if you’re using it). Dice the carrots, onion and garlic and sauté until the onions turn translucent and the carrots are pretty much cooked. In the food processor, puree the tomatoes and add the tomato paste and basil. Pour this over the sautéd vegetables and let simmer for a few minutes. When the pizza base is done, spread the sauce over the base (I used about half) and then top with toppings of choice! I used ground, cooked pork, black olives and drizzled some homemade pesto over. Stick it all under the grill for about 5 or 10 minutes until the toppings are warm. Or the cheese is melted if you’re using cheese on top. I have used flaxseeds in different recipes and also used flaxseed oil for cooking. In a pizza…never ever thought of that one but I will be giving it a try for sure. I am a big pizza fan so a combination of both seems like a great idea.